Synopsis: Two children must embark on a fantastic journey across a fading world of ancient legend and magic in an attempt to return to their home by the sea. Review: When The Academy Award nominations were released last week there were lots of hemming and hawing about the films that didn’t get the love many felt they deserved. Nowhere was that felt more than in the category of Best Animated Feature with the omission of the widely popular The LEGO Movie. While I was put-off by the film’s seizure inducing ADHD frenzied style, I must admit that I was as surprised as anyone that it wasn’t on the shortlist. 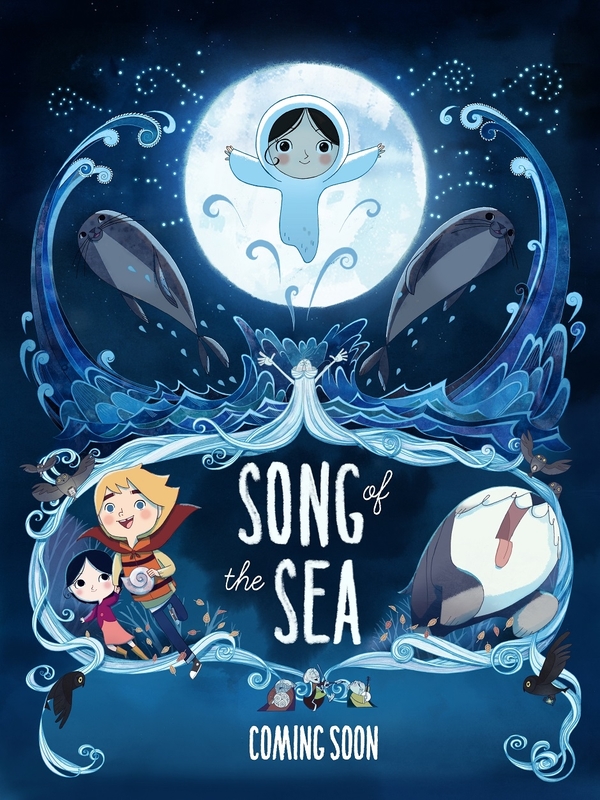 The thing is, though, even had it been nominated it would have undoubtedly been up against Song of the Sea and I’m not sure it could have bested this wonderful film from Ireland. It’s a true beauty, one that catches your attention early on with its striking animation and lush score before fully capturing your heart with its lovely Celtic folklore inspired tale. Living with their father in a lighthouse on the shores of the Irish coast, Ben and his sister Saoirse have grown up without a mother. A distant memory for him and a non-presence for her, the brother resents the sister that showed up the night his mother left while their father still grieves in silence, unable to be the present father the children need. When their feisty granny whisks them away to the city, Ben decides to steal off back home, begrudgingly letting his sister tag along. What starts as a journey home for two runaways turns into a fantastical adventure that will test sibling bonds even as it opens old wounds. Drawing on the oft-told myth of the selkie (men and women that are seals in the water and humans on land), writer/director Tomm Moore (Oscar nominated in 2010 for the also-impressive The Secret of Kells) uses the legend as a framework to tell a larger tale about the emotions we bottle up and try to forget. Moore creates a world of witches, fairies, and magic to illustrate how keeping our sentiments bottled up can wind up causing greater pain than merely allowing yourself to feel all of the hurts and happiness our lives can bring. Featuring hand-drawn animation that’s less 3D and more 2D lends itself well to the merging of the real world and the dream-like arenas Ben and Saoirse cross through on their passage home. With delicate curlicues spiraling through watercolor-like backgrounds there’s something of interest in every frame. If you really pay attention you’ll catch many hidden treats as power lines start to resemble animals and faces pop up in rocks, trees, and hills. Musician Bruno Coulais lends a delicate score to the film that’s as soothing as a lullaby, which several stirring passages are. With song/music playing a huge role in the plot there’s ample opportunity for Coulais to layer the film with haunting melodies and serene vocal tracks. As integral to the movie as the perfect blend of animation and narrative, it’s a beautiful marriage of the aural and visual. This movie really transfixed and transported me and I think it will have the same effect on anyone that comes into contact with it. Looking at the other nominees in the Best Animated Feature category (Big Hero 6, How to Train Your Dragon 2, The Boxtrolls, The Tale of the Princess Kaguya) I can’t imagine Song of the Sea going home empty-handed on Oscar night. It’s the high-water mark of achievement in animation for 2014 and earns a spot on my must-see list.